One of the things I love most about MDS is that the SU! products NEVER retire! The MDS challenge this week is to use at least two designer series papers in our projects. The DSP that I chose is from the Springtime Vintage collection that was available last Spring. Although we can’t but this paper any longer, I can still use it over and over again in My Digital Studio! Did you also know that I could create a “card” out of the DSP and print it out and use it just as I would the actual paper? YUP! that’s right! The scrapbook page that I created is one of many that I am working on from my incredible Founder’s Circle trip last month. When you arrive at the hotel you receive your name badge and a getting to know you game. You have to find the other gals that will be on your team for the rest of the FC retreat. 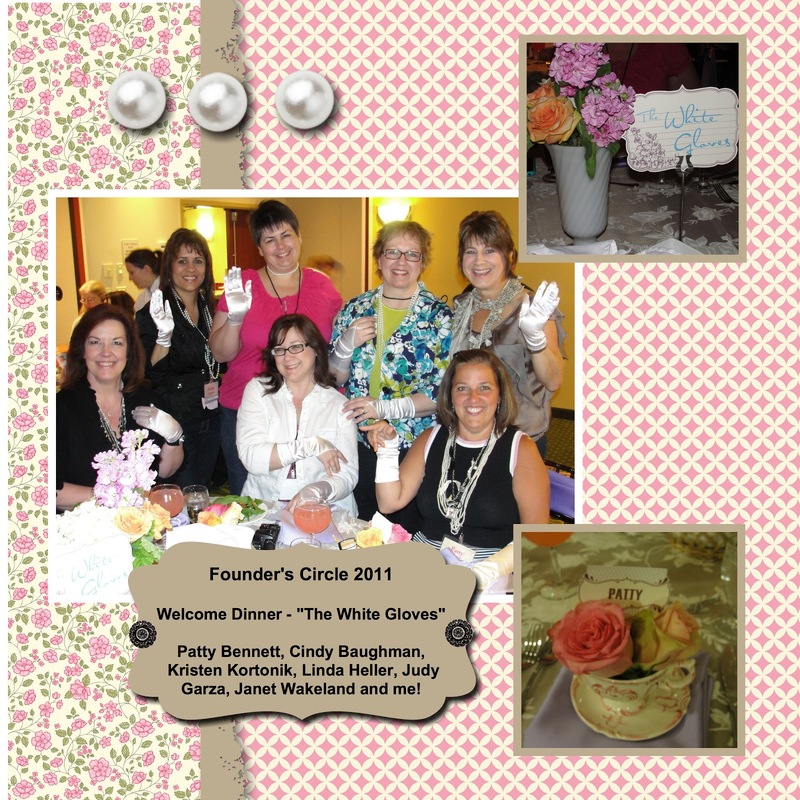 Our group was called the White Gloves. The group consisted of: Patty Bennett, Cindy Baughman, Kristen Kortonick, Judy Garza, Linda Heller, Janet Wakeland and little ‘ol me! What an awesome time!!!! Can’t wait to see them all again in January!! !